Home Knowledge Base How to Track Location with Mobile number. 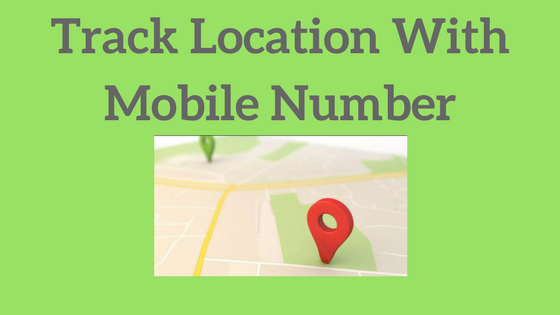 How to Track Location with Mobile number. Hello, Friends today I am going to show you how you can track anyone location with a phone number. You might be thinking to track someone's location due to many reasons, it could be your child or your spouse. Nowadays with latest technological development each day changing this world. 10 years earlier it was not possible to think of tracking anyone's location. But now the scenario has changed you can track almost anyone in this world with just a few clicks on your smartphone or your personal computer. But let me clarify you before you start tracking anyone's location with his/her phone number. Of course, its an offense. Only Government has the right to access someone without his/her knowledge. Along with government some private detective agencies or investigators do so. How to Use Android Phone As CCTV Security Camera. Here Are The Top 5 Best Phones Under 20K In India. To track someone with his phone number you must need his phone number and permission to track him/her. You can either visit Sim Provider or online service providers to track location. Along with this if you have a smartphone or IOS phone from Apple you can easily do so. Assuming that you already have access or permission to track the location of the Mobile Number I am going to show you how you can track location with the mobile number. So let's start with the first option if you have the phone number then first and foremost thing is to locate the service provider for that phone number. To do so you will need to follow these steps in below. Otherwise, you can skip this step to directly find location with mobile number. How to know about the service provider of a mobile number? You can check about the service provider of a mobile number by simply few clicks, you need to have internet connection on your phone to have this information. visit google and search for " how to find service provider of phone number". Oryou can directly visit TextMAGIC.com. the Next step is to simply type the phone number and pass the security check then click on Check Button. Make sure to have a correct Phone number. Caution: If you are viewing this Screen On your Phone then make sure to enable Desktop version in your browser to view the table of content correctly. Once you know the name of the service provider you can visit the Service Center to ask for location details. Only visit them if you have Permission to track otherwise they are not gonna provide you any details of that number. Once you have permission they will give you details like location of that number, what was the last number with which the person talked and much more. The second and best method that I love to go for is tracking online. Once you have the number you don't need anything else. simply visit a site, enter the phone number of that person to track his location.and within a few seconds. A map will appear showing the exact location of that person. So let's talk about, how you can do that. How to Track Location with Mobile number? For tracking location with phone number you simply need to visit this website and you are done! Simply go to google and search for "Mobile number Tracker" this website will appear in the first rank, if not simply go and find for it: mobilenumbertracker.com. Top 5 launcher apps for Android. My best ways to Hide Apps, images, Videos on Android. 5 Reasons Why You Should Read Books More. Once you entered the site, choose the country that you want to track location in. If you are tracking Indian number simply select India +91. Once you selected the country simply enter the phone number and hit the search button. Wait for few seconds.I am hoping that you have understood that how you can track location with mobile number. If you have any queries then ask me in comment below.